Trousers with quilted lining in dirt, oil and water repellent fabric. Pre-shaped knees with reinforced pockets for knee pads. Zip in sideseam from knee to botton of hem to make the trousers easy to put on and take off. 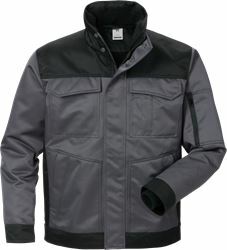 Material: Polydex, 100% polyester, dirt, oil and water-repellent. Quilted lining. Weight: Outer fabric 255 g/m², lining 100 g/m². Pre-shaped knees / Reinforced knee pockets with opening for height-adjustable knee pads / Zip with bellows pleat from knee to leg bottoms / Adjustable leg bottoms / 2 front pockets / 2 back pockets with flap and velcro fastening / Leg pocket with folding rule pocket and pen pocket / Leg pocket with mobile phone pocket and pen pockets / OEKO-TEX® certified.